It’s the time of year when we often are advising laterals and their firms on how to maximize the value of the move. Most advice you’ll read targets a lateral’s clients with active files that transfer and which are likely to have future potential matters the assignment of which is not guaranteed. Also, clients without active matters the lateral has represented in the past and would like to recapture. However, not to be ignored is selling to the clients and referral sources of the lateral’s new firm the added capacity, newly acquired energy and expertise the laterals present. While not exhaustive we recommend you consider the elements of the 7-point marketing effort below when laterals join your firm. Of course, this tactical mix is general and every lawyer’s situation is different as is the marketing culture and capacity at the firm at which they are arriving. It’s important to recognize that what drives the success of a lateral hire, however, for both the lateral and the new firm, will not vary despite those nuances. Success will be controlled primarily by the personal selling efforts of your attorneys. For that, you may want to engage a business development coach to work with both the lateral and concomitantly with some your key relationship-controlling shareholders (Yes, your veteran rainmakers. Think, cross-selling opportunities.). WARNING: An attorney in a law firm has multiple, sometimes overlapping duties, including potential fiduciary duties to the firm, contractual duties under the partnership or employment agreements, and fiduciary duties to clients. A departing attorney may find that these duties, which had previously coexisted peacefully, have suddenly come into conflict. The recommendations outlined here are a general guide and may not be acceptable in certain jurisdictions. Both your lateral and your key rainmakers should phone (leaving a voicemail has proven acceptable) the clients most likely to be significantly affected by or benefit from the move. “Didn’t want you to hear from anyone but me personally, I have moved to… “, the lateral might say. “I wanted to let you know in advance of our official announcement that we’ve had an attorney join our firm who will be able to help your company with…” your rainmaker/relationship partner might say. If your lawyers have time, include a few key referral sources in these calls. In these calls consider saying some of what the letters below might contain. How well does this work? One lateral we are coaching began making calls to former clients and within 48 hours of joining his new firm had set lunch to discuss a new matter with a dormant account. Send to the law firm’s clients. Sound overwhelming? Keep this manageable by sending to perhaps the 20 percent of clients who provide 80 percent of your revenue. Customize the letters as best you can to the interests of recipients even if that means fewer letters are sent. If you are are writing a construction company owner, for example, emphasize your new lawyer’s construction litigation and list representative matters. Avoiding a laundry list of all litigation. A construction exec doesn’t know what the FDCPA is but sure understands what OSHA can do to his reputation and profits. 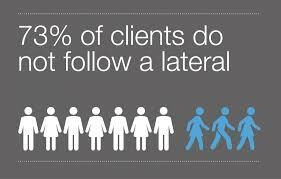 Ultimately, clients care more about how the lateral might be of benefit to them at some point. Explain everything in terms of their interests, another Carnegie truism. Send similar letters to referring lawyers and other professionals. Here you only need a single version of the letter unless, say, the professional or their firm have a specialty that aligns with your new lateral’s experience. Lawyers aren’t the only professionals who specialize. CPAs, insurance brokers and lenders, among others serve niche markets. Definitely include a representative matters list with letters sent to referring lawyers. A lateral’s cases and transactions say a lot. Shareholders should sign every one these letters, they’re personal. As you put together your list of clients and referral sources identify a select group and say in those letters, even better write by hand, something like: “Mary, I’ll be in touch (in the coming weeks/after the holidays) about having coffee/lunch so you can meet (first name of new lawyer).” You may have already suggested this to VIPs in the phone call I suggested above. Keep it short. Send to all firm clients and referral sources using a program that allows you to track how many recipients on your list open, click through to your website, forward, etc. For those who are unfamiliar with such software look at using Constant Contact or Mail Chimp. Example: “An experienced litigator who has tried 50 cases to verdict and is a former in-house counsel for a Fortune 500 company, Mary Smith, has joined us as shareholder. She will represent our growing number of energy company clients in policyholder rights suits.” A list of representative matters in which she served as lead counsel in appears here. In the legal industry, the average firm finds just 18 percent of its promotional emails are opened. Our client just had a 38 percent open rate for a new lateral announcement we believe because the content was crafted largely as described here. Update Martindale®, Super Lawyers® and Best Lawyers® profiles if you have them. Don’t forget the bar plus trade groups directories where you have listings. A survey conducted by the National Sales Executive Association reveals 48 percent of business-to-business sales agents are never following up with their leads at all. These are sales people, not lawyers. The same survey shows that 10 percent of sales are closed on the fourth contact, while 80 percent of sales are made on the fifth to twelfth contact. Remember, Carnegie’s quote and the repetition built into our recommendations here. Based on this data, we think it’s fair to say that the squeaky wheel indeed gets the grease – and in the case of the law, the future retention.